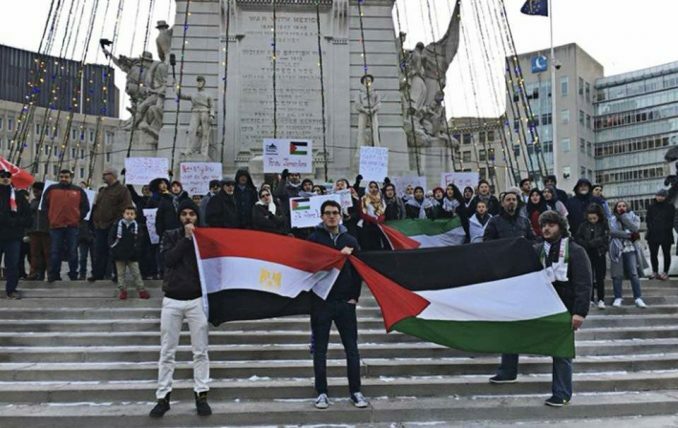 An emergency rally Dec. 10 in downtown Indianapolis denounced the Trump administration’s attack on the Palestinian people when he declared Jerusalem to be the capital of Israel. Called by Students for Justice in Palestine at Indiana University-Purdue University Indianapolis, the action featured speakers from Muslim Student Association groups at Butler University and IUPUI, Jewish Voice for Peace, the Egyptian Student Association at IUPUI and the American Friends Service Committee. Braving the cold, people assembled for a rally and marched to demonstrate that Jerusalem is the capital of Palestine. They stood in solidarity with resistance to Israeli apartheid. Free Palestine!